Western blot analysis extracts from mouse spleen and mouse brain using α-Synuclein (D37A6) XP® Rabbit mAb (Biotinylated) (top) and β-Actin (D6A8) Rabbit mAb #8457 (bottom). 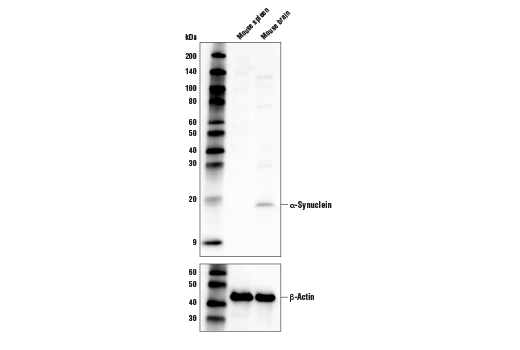 α-Synuclein (D37A6) XP® Rabbit mAb (Biotinylated) detects endogenous levels of the α isoform of synuclein. This Cell Signaling Technology antibody is conjugated to biotin under optimal conditions. The biotinylated antibody is expected to exhibit the same species cross-reactivity as the unconjugated α-Synuclein (D37A6) XP® Rabbit mAb #4179. Goldberg, M.S. and Lansbury, P.T. (2000) Nat Cell Biol 2, E115-9.